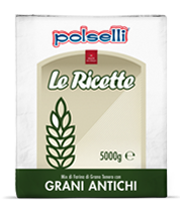 It is a flour of soft ancient italian wheat type “1” (among which, the Risciola, the Solina, the Abundance), the Farro and the Rye. It has a very low protein content, a strong color and an antique smell. It adapts to all types of processing and is particularly suitable for medium-short leavening. Wheat Flour Type 1, spelled and rye. Grilled vegetables, legumes creams and game. Amber in colour, more intense in parts, this flour stands out for its powerful aroma of freshly baked bread. This flour is a distinctive coral red colour, more intense in parts. It has a characteristic slightly spicy fragrance and flavour. Mainly used to make dark-coloured products with a strong aroma, this blend is rish in fibre, mineral salts and plenty of vitamins, especially in the vitamin-B group.